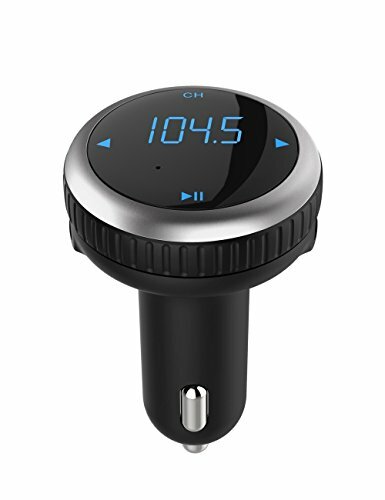 BT69 is not only a dual USB Car Charger, but also a Bluetooth FM transmitter car MP3 player and a Smart Car Locator. Simply open the App to get the car parking location, direction, distances and parking time on cell phone. Save you trouble and time to find your car. This unit takes the hands-free audio experience to an entirely new level, supports redial last call and voice broadcast. In addition, the 5V 2.1A USB charging port with built-in smart chip will get your USB devices faster to full charged. About TF Card/ U-Disk Music Player,this device just only as a player to read/play your music from your TF Card/ U-Disk in-order. It will not randomly play or chose to play. The music will be not play from the last one when you off car. It will star from first music again. 1.Insert it to the car cigarette lighter socket. 2.The LED displays the car voltage for 3 seconds, then enters into Bluetooth&frequency pairing mode. 3.Single press "CH" to enter the frequency settings. Find an empty station and keep the FM transmitter and car FM radio at the same frequency. Then it can play music. 4.Turn on cell phone Bluetooth, find the device"BT69" and click to connect. 1.Pull out BT69 before you start the engine. 2.Total working power CAN NOT EXCEED 12W. Crystal sound quality : CVC Technology creates full duplex sound and noise cancellation technology, to grant most crystal sound quality. Please be noted, due to radio frequency interference and car ground loop noise, it is almost impossible for any transmitter to produce a perfect audio. Dual USB car charge: Equipped with dual USB port 5V/2.1A Dual USB Charging provides fast charging speed. Simply plug into cigarette lighter socket. Control directly as an FM transmitter. Size: L45 W45 H74.5 mm . Weight: 34 g Every product from Aphaca enjoys 60 days money-back and 12-month warranty. If have any problems,pls email us.